If you haven’t heard of the Kumon method, now’s the time to prick up your ears. The Kumon method, based on a logical, simple step-by-step approach, started in Japan in 1958 to help children and teenagers supplement their learning. Since then, the philosophy has grown, and the Kumon workbooks have become a trusted way for children to build their reasoning skills, pencil skills and numeracy skills. Help teach your child how to tell the time with Kumon’s My Book Of Telling Time. 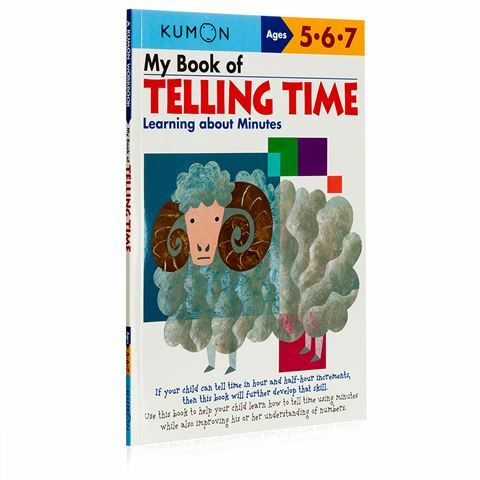 Aimed at children aged 5 to 7 who can tell the time in hour and half-hour increments, this book is the perfect way to supplement their education. Additionally, it’ll also help improve his or her understanding of numbers in general. Suitable for children aged 5 to 7. Based on the Kumon method, designed to help your child reach their full learning potential. Exercises become more advanced as the book progresses. Help improve your child’s understanding of time and numbers. Dimensions: 21cm (l) x 30cm (h) x 1cm (w).